In the previous tutorial, we showed you how to block email senders in your Hotmail account; fortunately, this is not a permanent setting, and you can always change your mind and unblock someone: in effect, you will simply need to remove that person from your "blocked list", the repository of email addresses where Windows Live Hotmail keeps track of whose email messages should be blocked automatically. As this imply, you can also decide later on to "re-block" someone. But let's now show you how to unblock them. The steps below explain how to remove a sender from your blocked list. 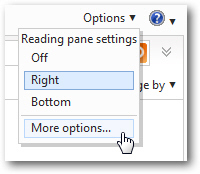 Once you have logged in to your Hotmail account, click on the "Options" menu near the top right corner of the window, and choose "More options" from it. When your "Hotmail Options" screen loads, locate the section labeled "Preventing junk mail", and click on the "Safe and blocked senders" link you'll find below. And on the next screen, click on the "Blocked senders" header to see your current blocked list, and all the email addresses it contains. The Blocked senders scrollable list displays, sorted in alphabetical order, all blocked email addresses you have added. Tip: to unblock multiple email addresses at the same time, hold down the control key on your keyboard ("Ctrl"), and click on each address you want unblocked, one after the other, and release the Ctrl key before clicking on the Remove from list button for Hotmail on Windows and Linux (on Mac OS X, hold the "Command" key instead). Within a couple of seconds, Windows Live Hotmail will reload the page with the updated blocked list: double-check that the sender was successfully unblocked by trying to find it inside the blocked senders listing: it should no longer be there.